Wondering how to create a cleaning schedule that works and doesn’t set you up for failure? It’s a New Year’s Resolution that many of us make. I’m here to tell you it is possible, and it’s easier than you think. 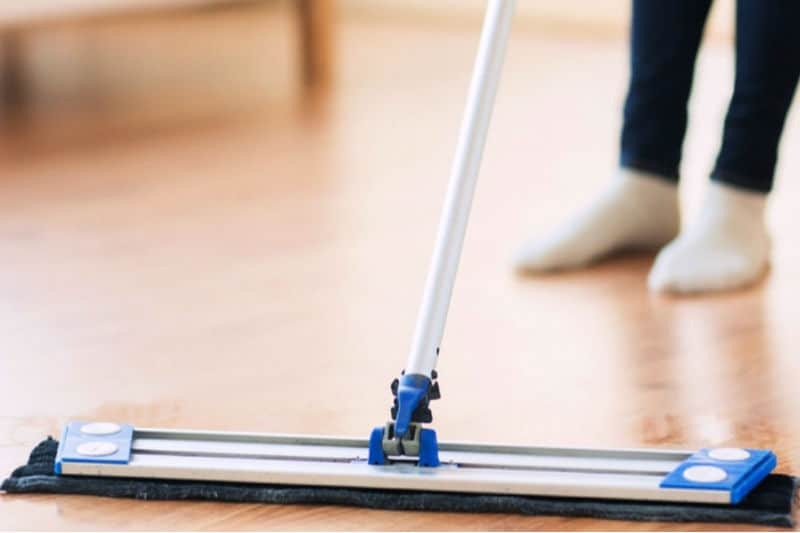 But maybe you’re just ready to establish a regular, ongoing cleaning routine to keep your home clean without spending all of your spare time on it. 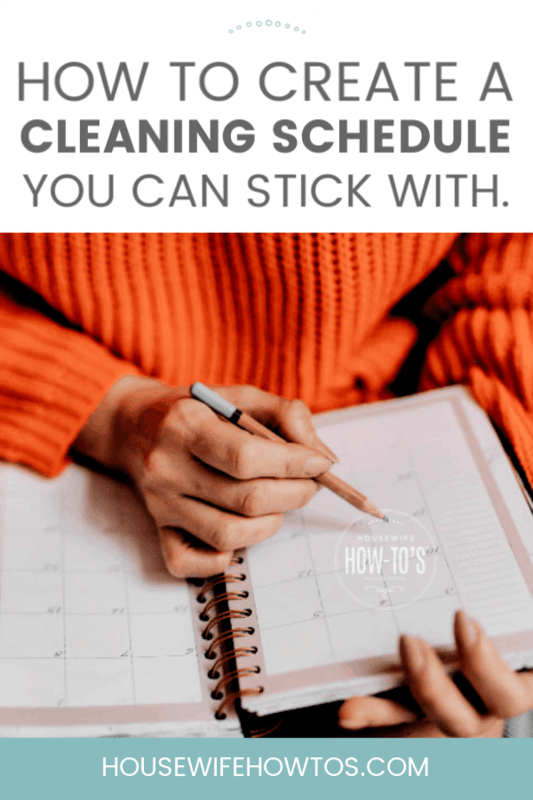 Today, I’m going to show you how to do just that by leading you through seven steps that will help you create a cleaning schedule that meets your needs. Sometimes, in our eagerness to make changes, we rush into new projects and find ourselves burning out. For example, after deciding to start exercising every day, we go out and run 2 miles. The next morning, we’re sore, so we skip it — which means we’ve already given up our goal of daily exercise. Since we abandoned our goal, we take it as proof that we can’t stick with anything. And that, of course, convinces us that we shouldn’t bother trying at all. Sound familiar? That’s why, when it comes to creating a cleaning schedule, it’s important to spend time strategically thinking and planning rather than just rushing in. You need to consider how much time and energy you have on both good days and bad ones and create a cleaning routine that you can keep. Here’s how. Why are you cleaning your house? I’m not talking about the need to deal with spills and messes. 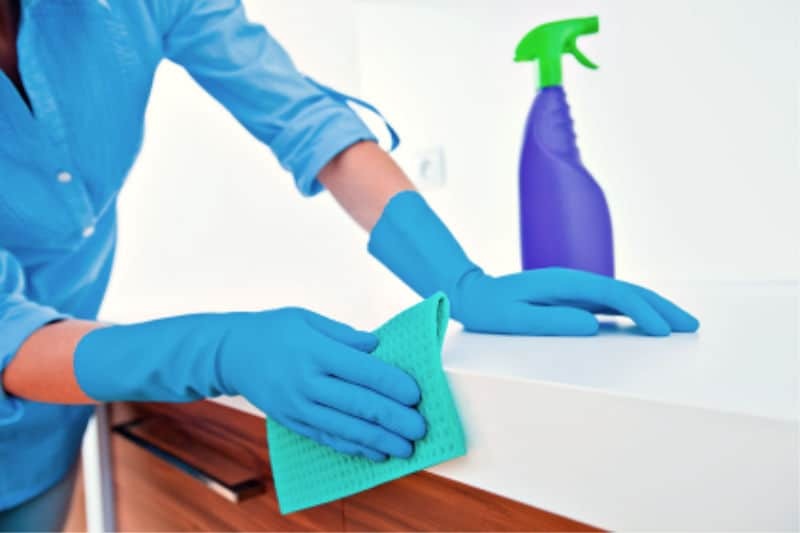 What I mean is that you need to know why you want your home to be clean: is it for you and your family, or is there some other standard you’re trying to meet? When you create a cleaning schedule, you need to make it all about you. In the years that I’ve been writing this blog, I’ve received so many emails and comments from people stressed by the pursuit of perfection. You know what I’m talking about: beds made every morning, not a speck of dust in sight, every surface sparkling and tidy — day in and day out. One reader sent me a despairing message because she couldn’t leave perfectly parallel lines while vacuuming like her mother-in-law does! So, before you sit down to create a cleaning schedule that works, ask yourself whose standard are trying to meet: yours, or someone else’s? If you don’t feel the need to have a home that’s continually ready for a magazine photoshoot, then don’t hold yourself to that kind of standard! I sure don’t. Most of us have a place or two in the home we need to be clean for our sanity’s sake. For instance, I cannot stand cooking in a dirty kitchen, and at the end of the day, I want to unwind with a glass of wine and a book in my living room. So, guess which rooms were priorities when I decided to create a cleaning schedule? Maybe you prefer your bathroom to feel like a spa and your bedroom like a retreat. Someone else may need an orderly entryway when they come home and a clean family room where they can watch Netflix after the kids are in bed. The point is to pick a room or two where you’ll focus a little effort every day to keep it in tip-top shape, while the rest of your house gets enough weekly attention to bring it up to your standards. We are all limited to 1440 minutes each day and need to spend some of them sleeping. You also need time to do enjoyable things, which means you shouldn’t plan to spend all of your non-working hours cleaning house. 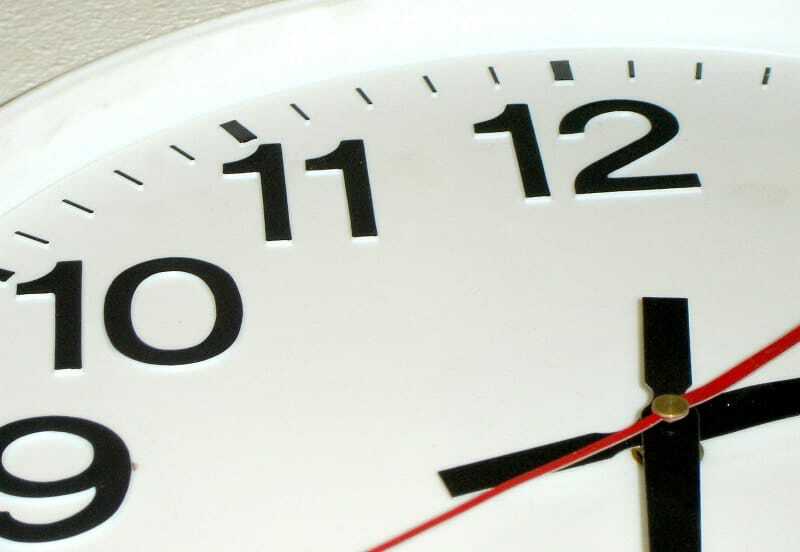 Do you only have a half-hour each weekday but plenty of time on the weekends? 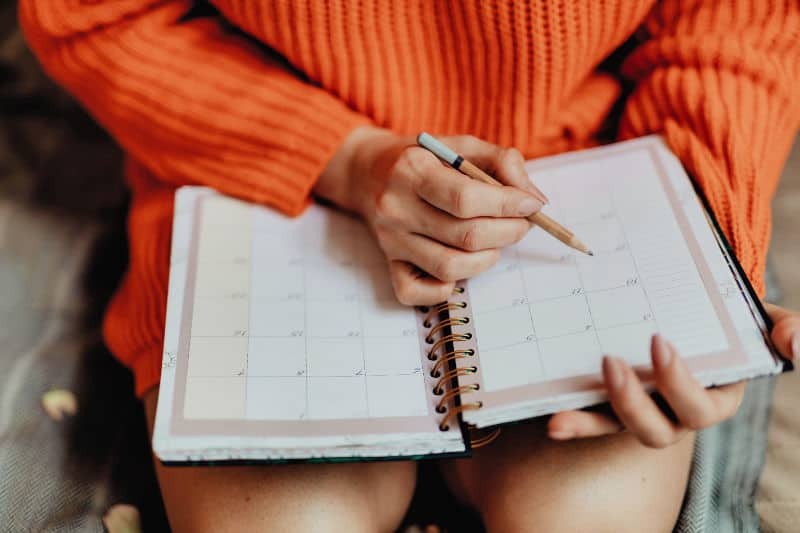 You’ll want to create a cleaning schedule that allows you to deal with your two most important rooms in your available time while scheduling the rest at the end of the week. Do you have more time during the week than weekends? Give your two essential rooms attention, then work on the rest of your home from the next most important places to the least. 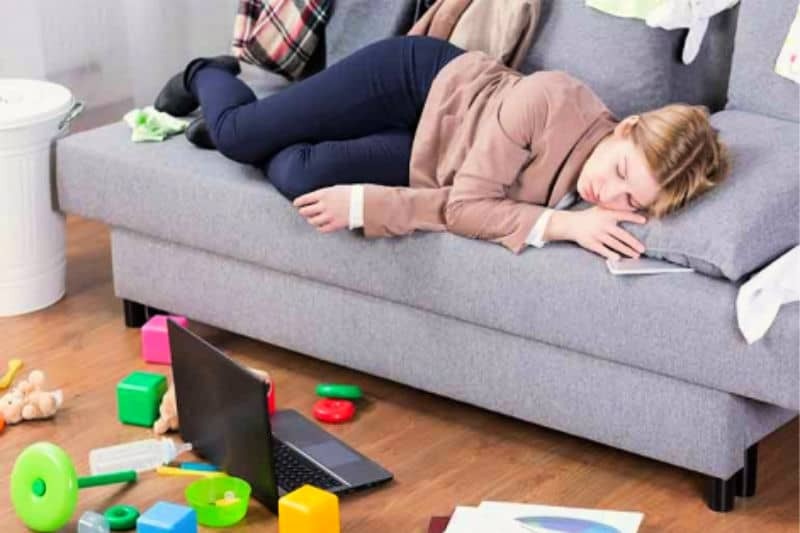 Some people prefer task-based cleaning, doing all of the dusting on one day, vacuuming the next, mopping floors on the third day, doing laundry the fourth, etc. Others prefer room-based cleaning, doing one room at a time. 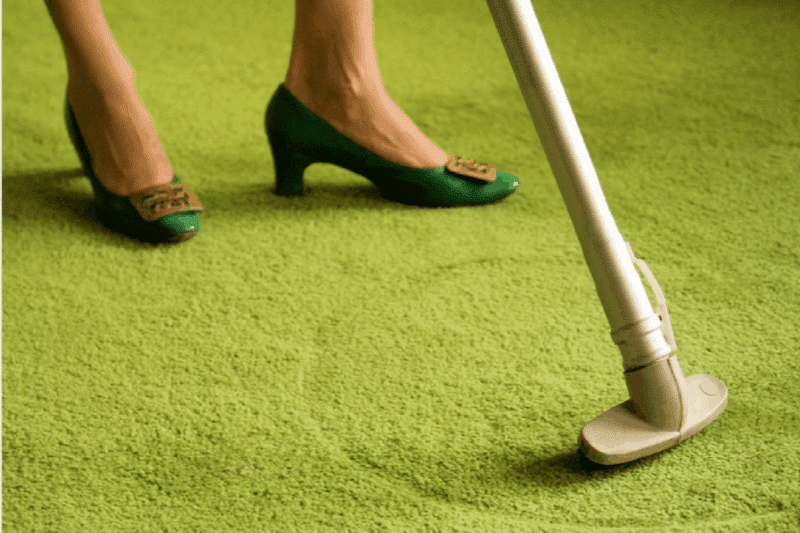 For me, vacuuming a house makes no appreciable difference if every room is still cluttered. I prefer doing a weekly cleaning in each room — and I use my weekly printable cleaning checklists to guide me through it. Are you a task-based or a room-based cleaner? Before you create a cleaning schedule, decide which approach works for you. In addition to tidying your two most important rooms, there are other tasks which shouldn’t be put off for days on end. Doing the dishes, for example, or taking out the kitchen trash. As someone who works from home, I’ve got a bit more time than many do, so I use this Daily Cleaning Routine to get the whole house looking tidy in the morning then do a weekly cleaning of one other room in the afternoon. The point is: determine what needs to be done daily to meet your standards and plan on doing that. 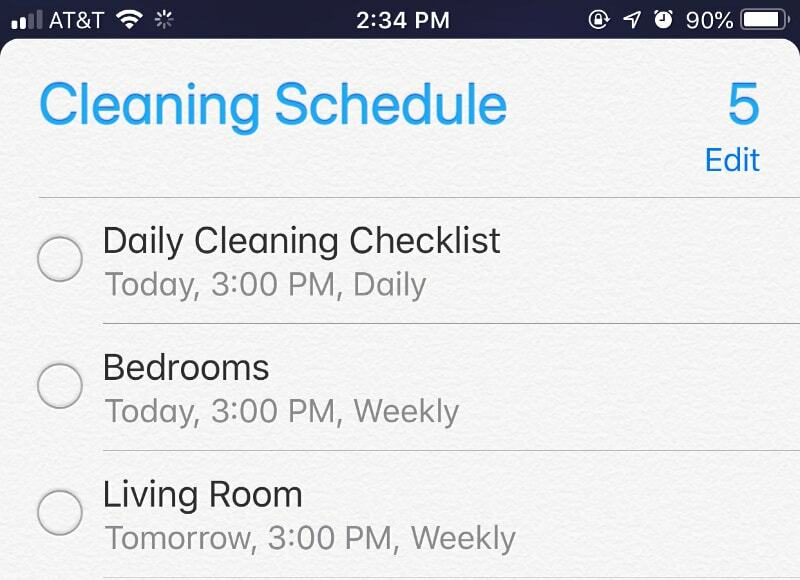 Make it official: add your cleaning schedule to your calendar. You can just note that Monday is the day you clean the bathroom or vacuum floors, or you can get specific and make an appointment with yourself. The point is to commit to the cleaning schedule you’ve created. Since I use a room-by-room approach, I’ve set up a recurring daily reminder on my iPhone to tidy up and weekly reminders for each room. Because I’m not a morning person, I set my reminders for later in the day to keep myself from marking them as complete just to be rid of the popup notification. Honestly, no one sticks to their schedule all of the time. Kids get sick. We get sick. 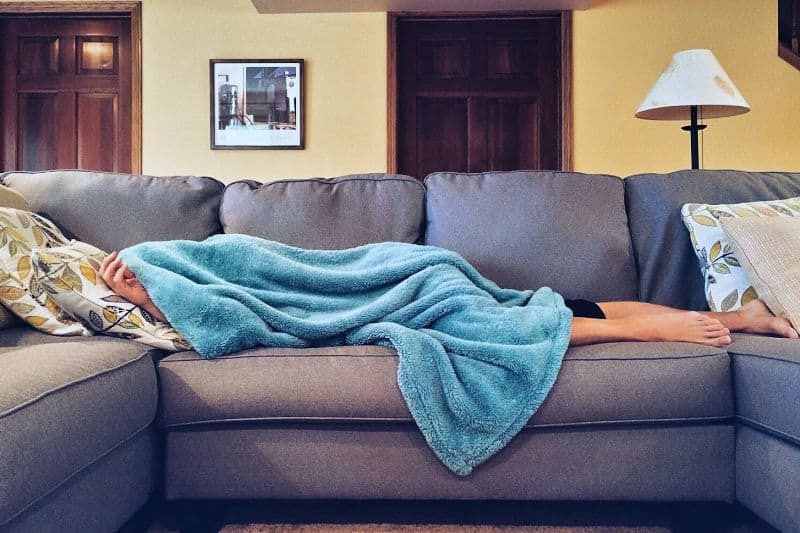 Hard days at work can leave us too exhausted to clean and in need of self-care instead. Life happens! There is so much more to life than having a spotless home 24/7. Whatever cleaning schedule you create should allow for that. Do your best to follow your plan daily, but if you need time off then permit yourself to take it — without guilt. 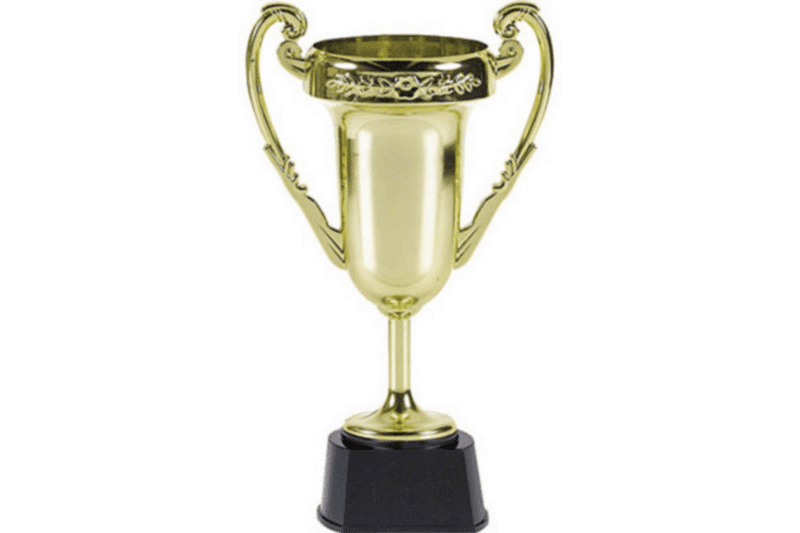 Remember: there’s no trophy for having the cleanest home. (Though you can certainly buy yourself one.) There’s no medal, no award ceremony, and your name won’t be in the paper. Since it’s not a competition, stop pushing yourself to “win.“ This is one instance where simply trying makes you a winner. I’ve started on the 30 day book, but have to say I started on Feb 2 and am only on day four! Am I really slow, do I have much more of a mess than I thought, or do other people have this issue? I am loving the results, but my self esteem is taking a bit of a blow. . . Please, please, please don’t feel down about this. As I explain several times in the book, there are a lot of things that affect how much time it takes to do the entire plan. It depends on the size of your home, whether you’re a perfectionist or just looking for a baseline standard, what else you’ve got going on in your life, how many people live in your house, etc. It is perfectly fine to take longer than 30 days! And, most importantly, your home isn’t you so it shouldn’t affect your self-esteem. Do what you can, when you can, and you’re already succeeding. It’s not “failing” until you give up! Having a cleaning routine really does make such a huge difference in daily life-especially if you have kids. I can’t go a single day without cleaning my house or it might fall apart, but that doesn’t mean it is always spotless! I really love that you made your first tip all about perspective. We all need to be reminded to give ourselves some slack now and then! You’re absolutely right, Keri. We need to give ourselves the same grace we’d give a friend. Very few of us would visit a friend and note everything that was out of place or messy. 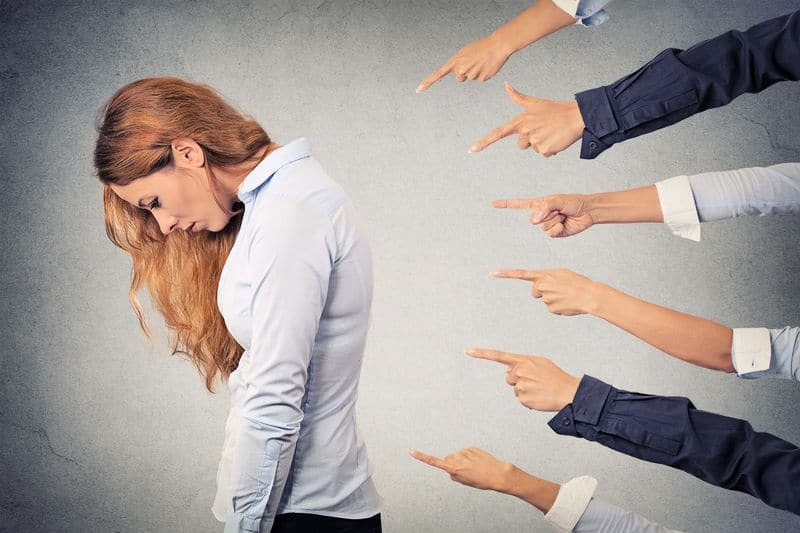 Why do we put so much pressure on ourselves?